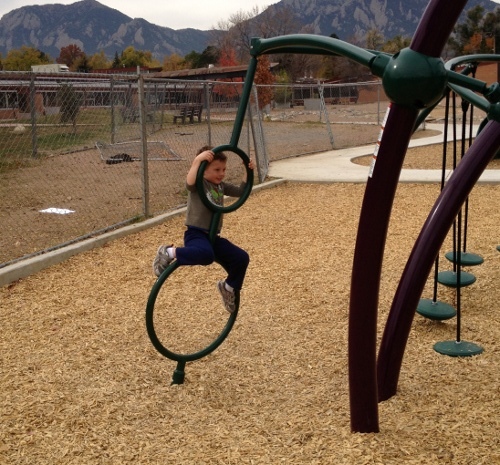 In 2013 the City of Boulder Parks and Planning and Horizons K-8 School partnered with other organization to update the Horizons K-8 school playground which is adjacent to Boulder’s Admiral Arleigh A. Burke Park. The project was completed in September and I was curious to see what had been done. 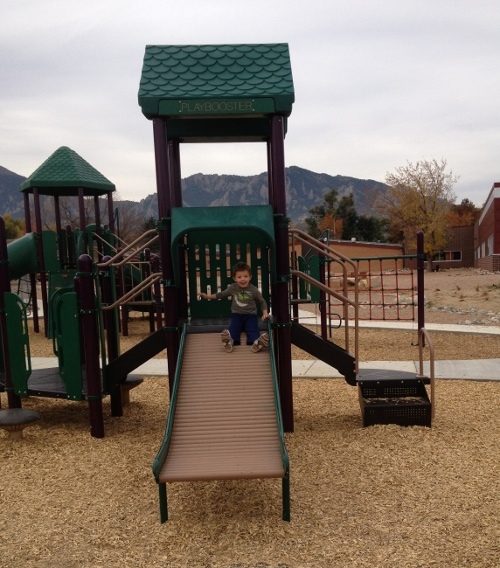 The playground is accessible to the community during non-school hours. Based on the website it was unclear to me whether the park itself had a playground or only the school grounds. Driving up, it became apparently the park did not have a playground. 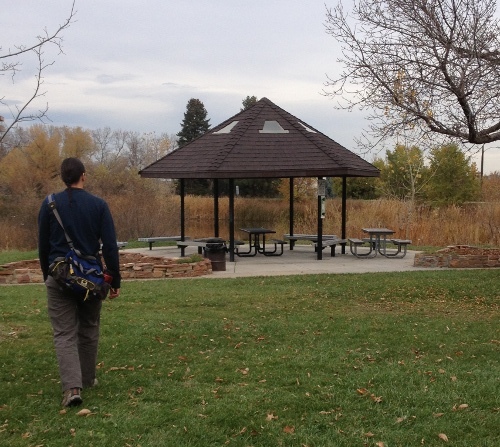 However, it did have a shelter with a picnic table and some benches. 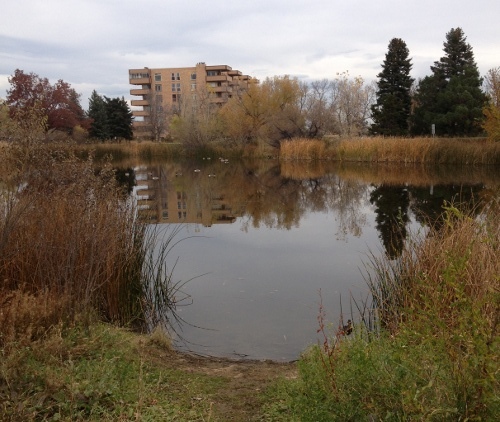 Thunderbird Lake is within the park and there are walking paths all around it. 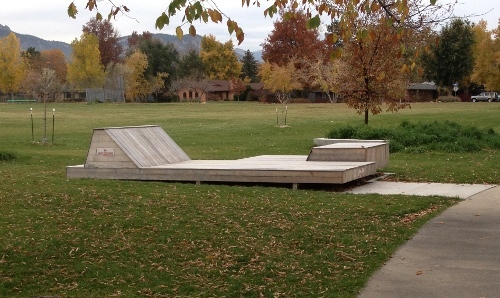 The park also contains a wood deck which was designed by a University of Colorado class for outdoor classes and meetings. The deck was suppose to be bigger but a pared down design was required in order to finish it by the end of the semester. There were big signs about not allowing skateboarding which the structure really looks ideal for. 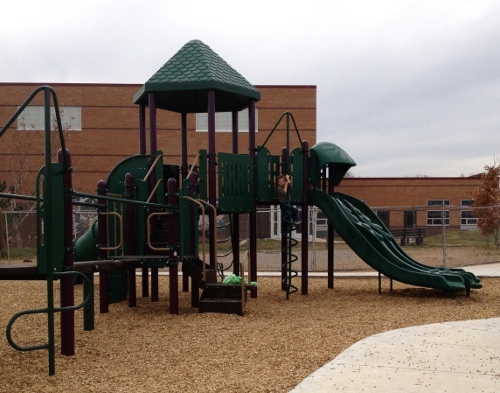 The playground itself is on school property. It has swings, a tire swing, and a tether ball. 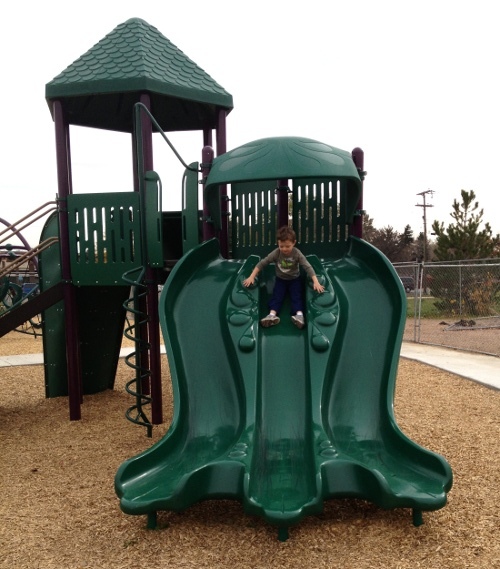 It also has new playground equipment which appears to use both the PlayBooster and Evos equipment from Landscape Structures. Calvin immediately gravitated to the roller slide. 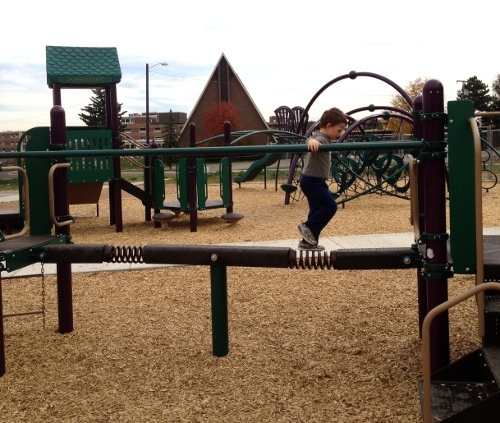 He slide down it once in the traditional style and spent the rest of the time pretending it was a treadmill. I think the Dakota Ridge Park was the first place I’d seen the Evos equipment. 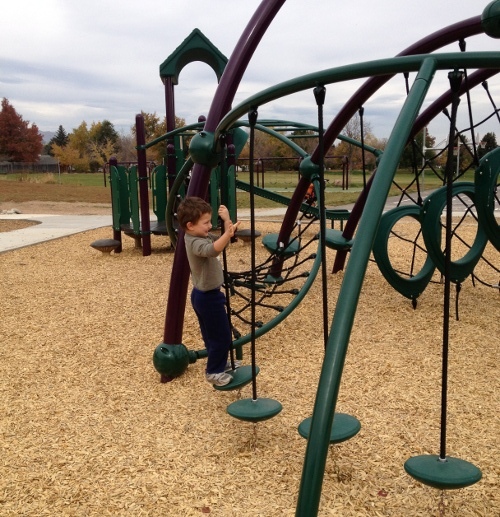 It’s very different from the equipment I had growing up with but Calvin loves playing on it and it provides him quite a bit of climbing and strength exercise. I’m now a fan. It’s hard to tell from a still picture but these circles rotate. After spending time on the Evos equipment, Calvin transitioned to the more traditional style equipment. He started with the fish net climber. The spring bridge was also fun. I’d seen a lot of double slides before but this was the first triple slide I’d seen. 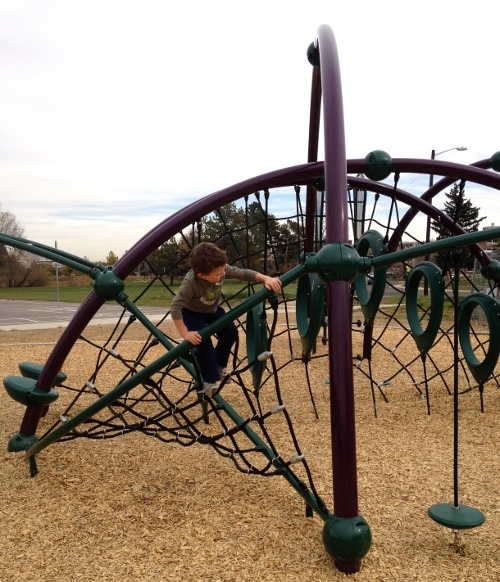 And finally, he had to climb up the Corkscrew Climber. Also on the playground was a sand area. However, there wasn’t any built-in equipment for it and I hadn’t brought any of our toys so Calvin ignored it. 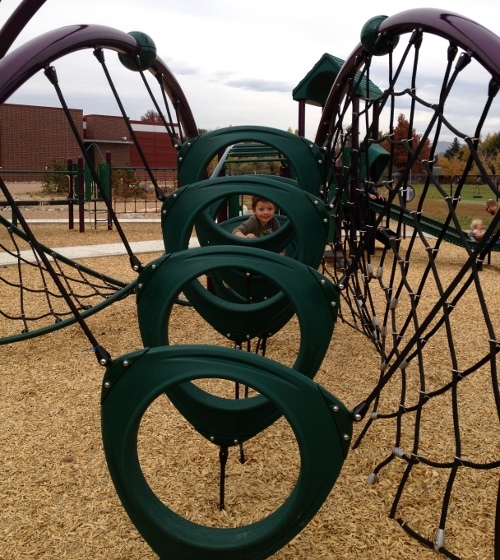 All-in-all, it was a very nice school playground. Picnic area There’s a covered picnic table but it’s not very close to the playground. 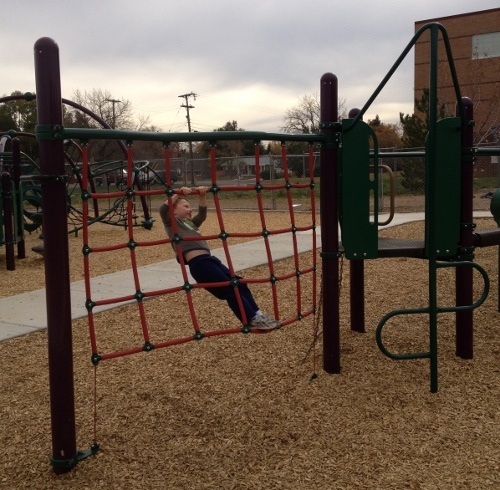 This entry was posted in Calvin, Parks and Playgrounds on November 1, 2014 by kiesa.